LONDON: Deputy Prime Minister Datuk Seri Dr Wan Azizah Wan Ismail urged Muslim women to come forward, develop their skills and realize their full potential, utilise their talents and entrepreneurial abilities if they were to see genuine long term improvement in our societies. 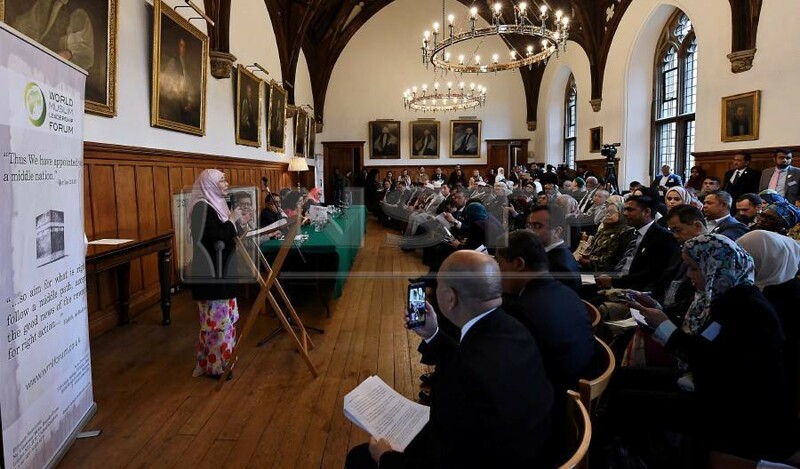 Dr Wan Azizah, who was delivering the keynote address at the 4th World Muslim Leadership Forum at Lambeth Palace in South London, said we can never attain social justice on the basis of skewed and unjust interpretations. “Human dignity, wellbeing and upliftment of our people irrespective of gender, race, class or ethnicity in peaceful, tolerant and inclusive societies are of utmost importance,” she said, emphasising that all of these must include the men. Dr Wan Azizah cited the Prophet Muhammad who used to work for a woman, brought his wife Aisyah to the battlefield and accepted another wife’s (Ummu Salamah) counsel during the Hudaibiah agreement. The deputy prime minister is on a three-day official visit to the United Kingdom. This is her first visit to the UK in her official capacity. Her keynote address was entitled “The Role of Women and Girls in Achieving Sustainable Development Goals (SDGs) by 2030”. “Sustainable development is necessary not only for survival or securing our economic endeavours but also as an extension of the qualities of rahmah (God’s mercy) that is ordained upon us,” she said. stressing that this was part of ibadah (worship). Pursuing the SDGs, she said, has to begin with having the right leader driven by a sense of personal responsibility to that purpose. However, she argued that the SDGs were inadequate as they are, in that they focus mainly on the social, economic and physical aspects of development only. “We are hindered by many constraints. The practice of Islam among Muslims continues to be shaped by local traditions and customs. Intolerance and narrow-mindedness still hamper our intellectual growth,” she added. Dr Wan Azizah reminded the audience that many verses of the Quran emphasise the role of both men and women in enjoining good and forbidding evil. “Islam has long recognised the property rights of women. Protecting the faith, self, intellect, progeny and wealth cannot be done by men alone,” she said. Accompanying Dr Wan Azizah are Deputy Foreign Minister Senator Datuk Marzuki Yahya and officials from the Women, Family and Community Development Ministry, Malaysian Charge de'affaires Mohd Suhaimi Jaafar and heads of department of the Malaysian High Commission here.